Heriot’s player/coach Peter Ross has asked his players for one big last effort as they aim to be crowned CSL Grand Final winners tomorrow. The Goldenacre side came from behind to win the CSL Eastern Premiership title last weekend, pipping Arbroath to the glory after a pulsating final day. That sparked celebrations by the Capital side, but they were soon back in training getting ready to take on West Premier Division champions Prestwick in the season finale at Ferguslie’s Meikleriggs ground this weekend. Wicketkeper/batsman Ross said: “It was such an amazing feeling last Saturday. “We went into the game knowing that we just had to concentrate on what we were doing against Aberdeenshire. We did that and the elation at the end was brilliant. “This was really the culmination of a three year plan, we knew that we had to build the core of a team who would help bring the younger players through and I have been so pleased with the way the group have worked hard together. “They have taken on board the things I have said to them as coach while the senior guys like captain Keith Morton, Mark Watt and Hayes van der Berg have really led things well and set the standards. “We are now looking forward to one last big game against Prestwick and having looked at their progress in the West this summer their team seems to be built on similar foundations to ourselves. For the match, Kevin McLaren is missing as he is at a wedding so skipper Morton has named a 12-man squad from which he will select the final XI. Craig Mackellar is also missing and the three players not involved last weekend against Aberdeenshire who are brought into the mix are Richard Cummine, Chris Acheson and Duncan Hamilton. Van der Berg, who finished the league season fifth in the batting standings, will be key once again. Meanwhile, RH Corstorphine will be at Falkland tomorrow with a spot in the CSL Eastern Premiership for 2018 up for grabs. 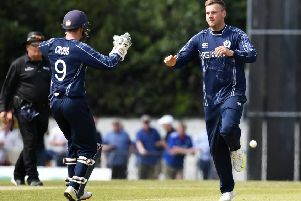 The Barnton men finished second in the Baillie Gifford ESCA Championship to Edinburgh six days ago, but the latter cannot be promoted so RH Corstorphine now take on Stoneywood-Dyce to see who replaces Falkland in the top flight.